Lagos MRS outpaced two top oppositions to win the Emir of Kano Cup of the ongoing MTN/Kano International Polo Tournament. It is the event's biggest prize. The Lagos team that arrived the Usman Dantata International Polo ground venue of the MTN powered polo fiesta as outsiders, proved bookmakers wrong with straight victories against tournament favourites, Kano Titans, before destroying the tall ambitious of former champions, Kaduna Fifth Chukker, to clinch their first major MTN/Kano polo title. Parading Usman Dantata, Bashir Dantata (Jnr.) Lereux Hendriks and Tom Bebruin, the MRS warriors defeated rich rivals, Kano Titans 9-3 in their Emir of Kano Cup opening game, and maintained their winning run against Fifth Chucker in a grudge final that truly lived up to its billings. The victory over the more experienced and better mounted Fifth Chukker was the second for the rampant MRS players who had earlier shocked Chukker in their first ever Majekodunmi Cup clash in Lagos last March. The prestigious MTN international polo fiesta that attract the biggest crowd to the ancient commercial city of Kano annually for the past decade, had earlier produced two brand new winners in the medium and the low goal categories that ended with pomp last weekend. Former Lagos State Finance Commissioner, Wale Edun playing alongside his son, Tobi, and two foreign professionals in GoodFellows colours, had eight strong oppositions from Lagos, Ibadan, Kaduna and Kano, to win the Dangote Cup, their first Kano title in years. Host Kano that fielded teams in all the four major cups categories of the MTN polo extravaganza that is staged as part of the Golden Jubilee Anniversary celebration of Ado Bayero as emir of Kano, could only manage the MRS Cup won by Kano AL Fajr. 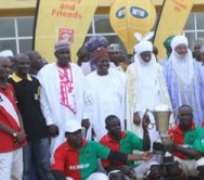 Kano Polo Club Chairman, Bashir Dantata who played alongside three of his sons in the historic Alhamdu team, described the MTN'2013 international polo tournament as the most competitive and the most exciting in years. He thumbs-up MTN Communication for promoting polo and sports generally in Kano and Nigerian as a whole, noting that the relationship between Kano polo and MTN over the years has had a positive impact in the society. MTN Regional Manager, Aliyu Musa, who congratulated the Emir of Kano, Dr. Ado Bayero on his golden Jubilee anniversary on behalf of the communication giants, assuring that MTN will continue to support endeavours that promote the unique lifestyles of its millions of subscribers across the country.